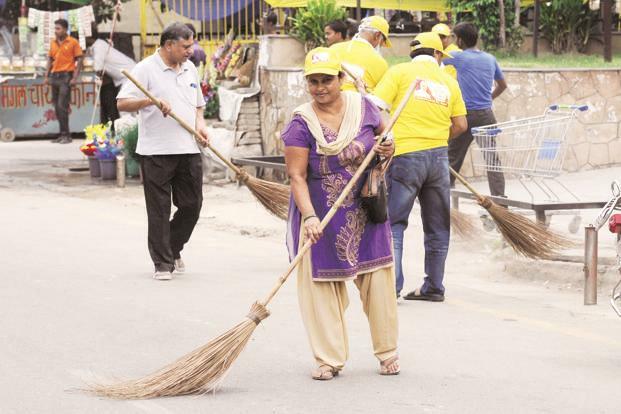 A couple of weeks back, a video made by a private organization promoting the Swachh Bharat Abhiyan, featuring Kangana Ranaut and other Bollywood actors, went viral. The video depicted the picture of goddess Lakshmi disappearing from photo frames when people indulged in littering. The narrator on the video was Amitabh Bachchan, who said that the goddess of wealth lives only where there’s cleanliness. It ended with a plea by Bachchan and Ranaut to keep the country clean by not littering. Though the government didn’t issue this particular video, it has issued other, similar ad campaigns in public interest that promote the use of a public toilet instead of open defecation. It is largely believed that ad campaigns change public behaviour by creating a change in people’s mindsets, which in turn leads people to take the desired action. But changing behaviour is not so easy. There are too many assumptions for this model of awareness leading to action. The first assumption is that people can recall the message all the time. The second assumption is that the message is successful in motivating people to such an extent that it prompts them to act. The third assumption is that at the moment of actual behaviour, people would have the right amount of motivation, and also the ability to act in the desired way. That is a tough ask. This is not the first time that the government has used ad campaigns to try and change public behaviour. In the recent past, campaigns like Save Fuel, Save Money have been aimed at changing driver behaviour by asking them to switch off car engines at traffic junctions to save fuel. Do you remember the campaign? If you don’t, crores of rupees in the form of advertising have been wasted. But let’s assume you are one of the few who do recall this message. Has it changed your behaviour? Do you now switch off your car’s engine at traffic signals? Most people don’t. It’s a lot of effort. You need to turn the ignition off every time you wait at a traffic signal. And when the signal turns green, you have to turn the ignition on, listen to frantic honking because you haven’t moved immediately, change the gear from neutral to first if you are driving a manual-gear car, get frantically honked at again, put the hand-brake down, and finally get moving. Even for people who are highly cost-conscious or environmentally conscious, it’s too much effort. That’s why campaigns are a money-draining and time-consuming way of attempting to change behaviour. In the UK, for example, in the 1970s and 1980s, the government spent millions on TV, radio and billboard ads educating people to wear seat belts. Researchers F.M. Streff and E.S. Geller estimated that by the end of the 1980s, 80-90% of British people had seen these ads eight-nine times each. One would assume that showing people being launched head-first through their windscreens would make people respond. But it turned out that most people weren’t wearing seat belts. It was when the law changed in 1983, along with strict policing, that most people started wearing them. Behavioural science suggests that a lot of the messaging on educating people to change behaviour seems powerful and emotional in the spur of the moment, but eventually doesn’t change behaviour because mere awareness rarely leads to action. Changing behaviour is tough. People don’t always behave in the desired way. People should be exercising regularly, but many don’t. People shouldn’t be overeating, yet many do. The traditional way to change behaviour is to make people aware of the pros and cons of a particular act. But this method is ineffective, because most behaviour is instinctive i.e. subconscious. We aren’t always aware of the reasons for our actions. It takes a lot of time, effort and money to make someone aware of their behaviour, convince them that change is necessary and motivate them to change. Behavioural science, on the other hand, uses subtle on-time nudges to enable the desired action. It focuses more on the ability to perform the desired action in the last mile than on motivating people. 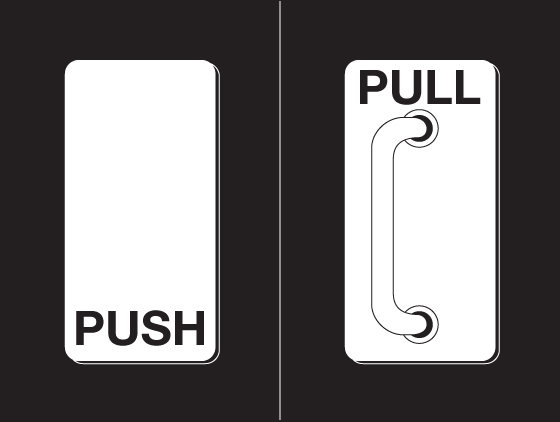 These nudges are based on a combination of behavioural economics, cognitive neuroscience and psychology. The nudges are designed to automate the desired action and for it to take place right at the moment of action. For example, to reduce honking, we conducted an experiment in which a red button called Bleep was fitted on to the dashboard of the car. When the driver pressed the horn, the red button would begin to beep and flash. In order to switch it off, the driver needed to press the button. The button made the driver conscious of the habit of honking by giving him immediate feedback in order to reduce indiscriminate honking. In a six-month experiment, Bleep reduced honking by 61% on average. Similarly, a nudge was used in Copenhagen, with green footprints painted on the ground, pointing the way to the nearest garbage bin, that reduced littering by 46% by painting. Meanwhile, to keep India clean, we first need dustbins that are easily accessible and cannot be stolen. 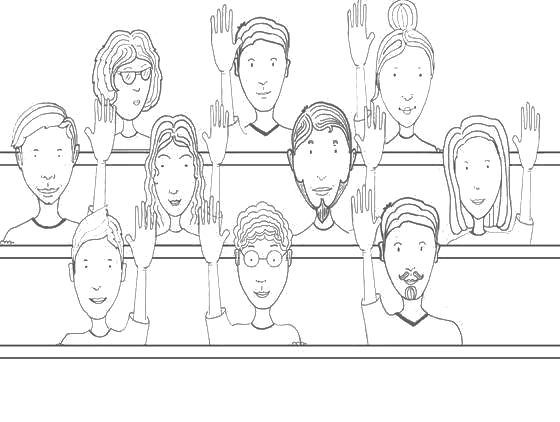 They could be designed to include that extra bit of motivation for use—for instance, by having two sections and a question such as: “Who’s your favourite actress: Kangana or Deepika?”. Have trouble waking up in the morning? Do you hit snooze on the alarm repeated like me, only to go back to bed and wake up later to realize that you are, as usual, late? 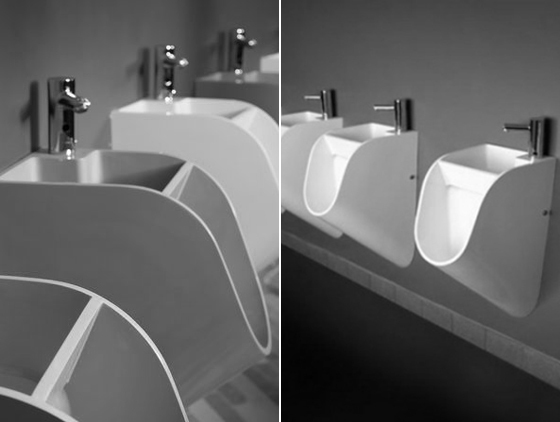 Here are two interesting products of Behavioural Design that could be of help. Clocky and Tocky are products created by Gauri Nanda, an MIT grad. 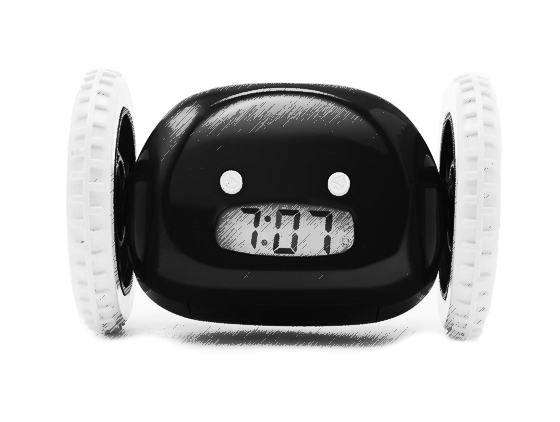 Clocky is an alarm clock with wheels. When it’s time to wake up, these alarm clocks leap off your nightstand and run away beeping to ensure you’re awake. Tocky even lets you load your own wake up message or your favourite song. See them in action by clicking here. 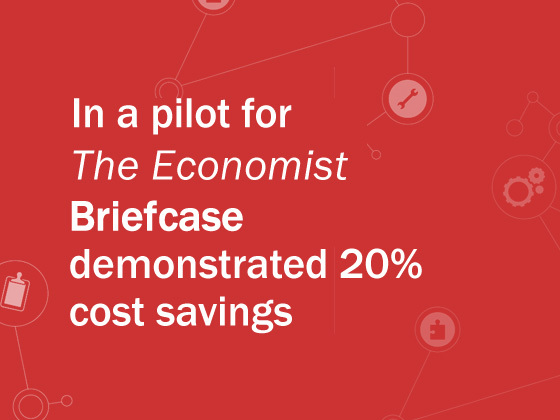 In a pilot for The Economist India, Briefcase demonstrated 20% savings of the customer retention budget. In the challenging environment of magazine subscription renewals, Briefcase achieved similar subscription renewals as existing levels, but at 20% lesser cost. Thus demonstrating a 20% savings in the customer retention budget. The rest of course is confidential. We were invited for the first ever TEDx – Q&A session for VJTI engineering students and makers, on 17th September 2014 at the VJTI campus (VJTI is one of the premier engineering institutes of India having received funding from The World Bank). A big thanks to TEDxGateway’s campus connect initiative. What an awesome time we had answering questions from curious minds at VJTI about Bleep, its future, human behaviour, behaviour change, Behavioural Design and the role of technology in Behavioural Design. Students of VJTI were shown our TEDxGateway talk on Bleep and Behavioural Design immediately followed by a Q&A session that seemed like it would have lasted hours because the questions just wouldn’t stop from the enthusiastic crowd. But of course we had to have a maximum time limit of an hour. Here are highlights of the Q&A session. Questions naturally began about Bleep and its future. We explained to students that Bleep being a product that solved a social issue and not an individual problem, is the responsibility of the Government of India. Which is why we aren’t selling Bleep to individual customers who we believe will hardly form any numbers. Plus Bleep won’t help car manufacturers sell more cars so they won’t install it voluntarily either. After some question and answers most seemed to accept our answer but some still seemed optimistic that Bleep could be sold to individuals. May be it was their optimism bias. May be one day we’ll be proved wrong. The most interesting part of the session was the discussion about Behavioural Design and behaviour change. We sensed that the students found it to be a new, unique and intriguing concept. We spoke about irrational behaviour, difference in attitudes and behaviour, why we cannot solely rely on will power for behaviour change, why most educational campaigns don’t work, how we create false memories, why we use Behavioural Design and not work towards increasing people’s self-awareness and how collaboration between engineers and designers can design new products that facilitate behaviour change. One of the curious students having read about People Power (click on the link to read about it) before attending the session, asked us to speak about the experiment. So we obliged and told them about how human behaviour is contagious. Like right there in the auditorium once the first student raised his hand to ask a question, seeing him one by one the others followed. Soon we were asked if we had solutions for littering, spitting, eve teasing, not talking on the mobile while driving and so on. May be one day we may. 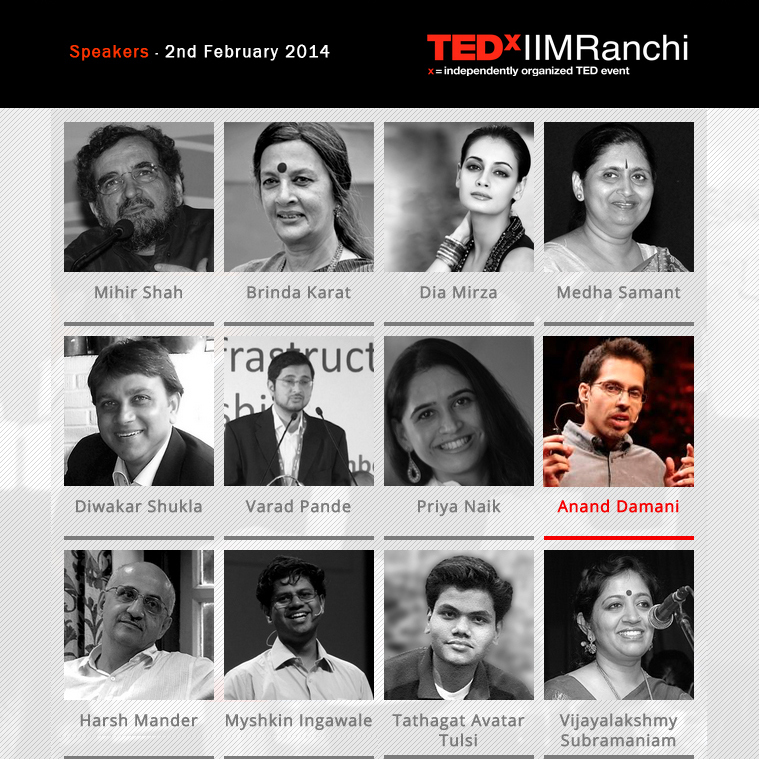 After TEDxGateway, the next Behavioural Design talk is at TEDxIIMRanchi on 2nd Feb, 2014. Again, lots of interesting speakers. We’re sure what we learn from other speakers and the audience will help us improve our knowledge and also this blog. 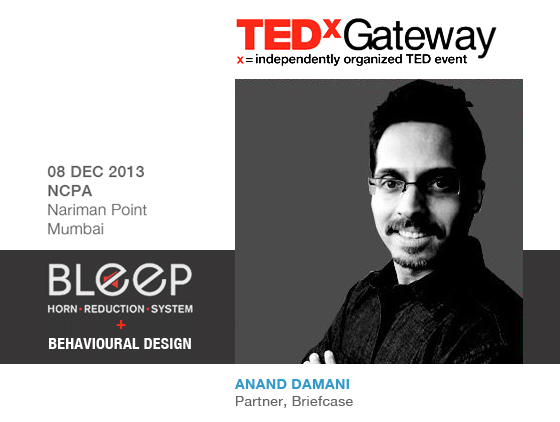 Friends, I’m speaking at TEDxGateway on Bleep and Behavioural Design. There are lots of interesting speakers lined up. So come over to NCPA, Mumbai on 8th Dec 2013 to listen and discuss some stimulating ideas and thinking that could change the way you view the world. All the information is here – www.tedxgateway.com.